Line a cookie sheet with aluminum foil or wax paper and clear some space in your fridge. Crush cookies using a food processor or a blender. The cookies should be crumbly, but not totally pulverized. In a measuring cup, combine condensed milk, vanilla, and peppermint extract, stirring until incorporated. Pour this mixture over the crushed Oreos, and stir until ingredients come together. Working quickly, form the mixture into 1″ balls by rolling between your hands, and place them on cookie sheet. Even if the mimxture feels sticky at first, it will roll into balls well if you use your palms. Put the balls into refrigerator to chill (for easy dipping). Melt the chocolate using your favorite method. I like to use my double boiler, but you can use your microwave in 10-15 second increments as well. 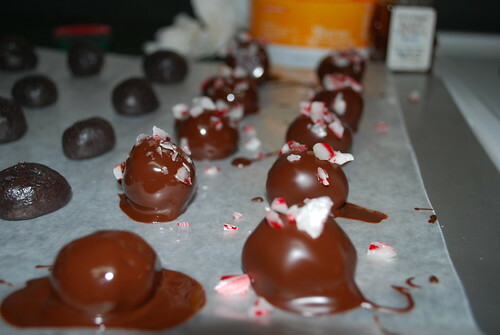 Dip chocolate balls into melted chocolate and put back on cookie sheet. 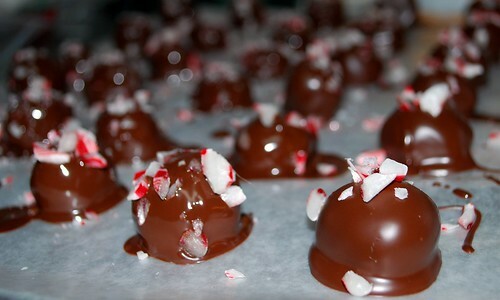 Sprinkle with crushed peppermint, and return to fridge until chocolate hardens. Yummy! We took a tin of these with us on our trip to the mountains for New Year’s Eve and they were a BIG hit! There were only 4 of us, and we polished this batch off with ease. Oops! Guess it’s time for New Year’s Resolutions . . .